ITProTV Review: "Great learning at your fingertips!!" I currently use ITPro.TV to aid my studies towards CompTIA Security+ & Cybersecurity Analyst (CySA+) qualifications through the Cyber Ready Scotland programme. This was recommended to me through my workplace but all studying is done in my own time. Videos are clear and concise. I also love the length of them as they are "bitesize" chunks. The transcripts being provided is also a very good feature. The lecturer (Wes Bryan) also seems knowledgeable but also very down to earth, which makes listening to him easy and fun. The practise labs are very well documented and easy to follow. Videos can sometimes seem a little quiet across the board on the desktop version, mobile version volume is fine however. The desktop site's help button can also be a little obstructive and it would be a nice feature if the course list scrolled independently of the main window. The labs (as far as I can see) do not support a copy/paste feature; this means exercises that require powershell scripts need them to be typed manually each time. ITPro.TV is well suited to all users looking to gain further knowledge and is a great overall learning tool. Knowledge is communicated clearly and potentially difficult concepts are broken down with simple examples or anecdotes. "Longest review ever, but I cannot speak highly enough about ITProTV"
ITProTV is unfortunately not used by my organization. In this industry, if one is stagnant, they are quickly left outdated and perhaps unemployed. ITProTV has given me the tools that I need to keep current, without leaving it to me to do all of the "heavy lifting". Instead of scheduling study time that is dedicated to a sometimes tedious subject matter, I find that I look forward to viewing their courses much like someone looks forward to their favorite sitcom. The combination of practical scenarios from experienced instructors, and their parallel focus of ensuring those seeking certifications get the information they need to pass, really sets ITProTV apart from other services. I didn't begin my subscription hoping to improve my value with my company, but there has been a direct relationship between the two. I hope ITProTV holds to its values and continues to make keeping my skills up to date as entertaining as possible. My only complaint is that there is much less Don Pezet hosting shows! WHAT HAVE YOU GUYS DONE WITH DON!? Their content, instructors, producers, and management understand the value behind quality audio/visual content. This really has an impact for me, because I actually look forward to viewing "episodes." Instead of stressing out trying to conduct research, I get time to relax and learn/re-enforce skills that ease the pressures inherent to my duties at work. The additional tools to supplement the courses and the organization of course material was once a minor complaint. However, I think ITProTV has found a comfortable format that is intuitive, simplistic, and aesthetically pleasing. This is just one example where I've found that over time, they are actively exploring and implementing ways to improve their platform. I'm not talking about Windows 10 "improvements." ITPro obviously values their clients, and takes pride in their services-- and there are very few companies these days that I can confidently make such a statement about. Active engagement is key when attempting to teach material and there are a variety of learning/teaching styles. With few exceptions, I believe that ITProTV has chosen hosts who feel more like co-workers who want to help each other out, help them develop themselves, and give them the tips, tricks, and tools to be able to do so. Certain membership tiers allow you to download content, which is extremely helpful for someone like me, who has to travel frequently. Especially when going internationally to areas that may not have the infrastructure conducive to stream video. Support is quick, friendly, responsive, and even follow up to ensure any problems have been resolved-- and not just asking that one fill out a survey, but genuinely putting forth effort into incident resolution. Similar services offer a spotlight approach to their subject matter. It may seem on the surface that ITProTV lacks in variety compared to others. The courses offered by ITProTV are chosen because they are the most widely encountered technologies used in businesses worldwide. This "laser light" approach allows them to focus on what beginners and professionals require. It's not terrible, but I'd really like to see some improvements in their mobile apps. One of the hosts (I can't think of her name) is somewhat distracting because she seems nervous or lacks confidence. I've wondered at times about the decision to put her in front of the camera. Don Pezet is such a good instructor that I'm disappointed when he is not included in newer content. ITProTV really felt (in the past) like Google once did, a family of individuals working towards the common goal of enriching the experience of the customer. When Wiley became involved, I was concerned that things might change for the worst. So far they haven't, but it is still a concern that ITProTV could eventually lose focus and lose the values that I appreciate. I've encouraged co-workers and non-coworkers to watch the live streams of ITProTV. Unfortunately, my company currently uses CBT Nuggets (none of the people I've asked like it/utilize it), but those who do take the suggestion often ask the same question: Why do we not use ITProTV instead of CBT? I met a young man who was in his final year of college pursuing an accounting degree. He asked me about the IT industry. I suggested he look at ITProTV in order to see if there is a subject he's interested in. He immediately signed up, and while working two jobs and going to school, he managed to get his CCNA and pass the Microsoft 70-410 within 6 months. We hired him. If you just want to hone your skills, ITProTV delivers. If you are seeking certifications, ITProTV delivers. The only demographic that I can imagine where it would be unsuited, is simply for those who are ignorant that nearly every industry involves some form of technological understanding. ITProTV is good for end users "non-IT personnel", as well as those supporting end users. ITProTV is really an incredible platform. I'd heard of them in advertisements on a number of podcasts I listen to so when my supervisor mentioned she was looking into cost effective training for our team I mentioned ITProTV right away. I've been throughly impressed with the amount and caliber of the the content provided by ITProTV again and again over the past year. The videos are truly fun and engaging and the hosts aren't simply reading off a power point slide. Additionally, although the videos are divided by topic/content area, they are split into ~30min. chunks so you can watch a video in one sitting without having to commit too much time. The navigation and UI is very well thought out though I wouldn't mind having a more responsive search feature. ITProTV really does cover just about everything an IT team could want from entry-level hardware/software topics and technologies to advanced certification training. The business plan (which our team has as opposed to the individual plan) also includes Transcender practice tests. My supervisor can see how much (or how little) I'm using the platform which allows her to justify the purchase as a budget item or decide to allocate monetary resources elsewhere. I'd like to see more content on Enterprise technologies like Splunk, Ansible, Chef, Vagrant, Docker, etc. Some of these are prohibitively expensive to get and use in a test environment or have a notoriously steep learning curve. Sifting through online documentation is probably the least engaging and useful way to learn about them as well. I'd like to see even more content geared toward cyber security. This is a huge and growing field, but the amount of content currently on ITProTV for cube sec is relatively small in relation to the other content they currently have. ITProTV is GREAT for smaller teams looking for a cost effective solution to help their team members skill-up and stay up-to-date on current tech and certifications. It's equally good for larger teams who wish to have a ready available resource for their team members to access and train. The ability to stream to multiple platforms (desktop/laptop, mobile, smartTV, etc.) means that you can access the content anywhere. If a team is only acessing the content infrequently or doesn't need the Transcender practice tests then an individual plan may be best. If there is only one technology that a team is focusing on (Apple certification, MCSA certification, etc.) then this may not be the most cost effective solution. User Review: "ITProTV... a Training No-Brainer"
We use ITProTV in the Technology Department. It helps solve the problem of training. It is difficult to plan specific training days and we now have the flexibility to train when we need to and train on the topics that we need. I use ITProTV myself for project management training and higher level training and my team members use it for training specific to their duties. The content isn't dry. There is a good balance of humor and training and is more engaging than other options. Work at your own pace is great! I would never be able to dedicate multiple days for training, so ITProTV helps me get a few episodes of training in per week and on my own schedule. The content offerings are great. It isn't just Comptia or ISC. LSS, GIAC, Cisco, Microsoft, and many other vendors are used which makes this a powerful tool for a wide scope of training needs. The labs are fantastic. Other trainings might speak in theory about how things will look on the screen, but being able to fire up a VM and click on changes is a key part of the learning process. The episode download feature could use a little work (speaking about the Android experience). When you download the episode, you need to go to downloaded in ITProTV instead of just playing on the normal episode content screen. It works well for what it is, but it would be nice to have the downloaded content play straight from the episode screen. I've had a few little issues with the Roku. It works great, but there have been a couple times when I needed to contact support because the Roku kept saying I wasn't a subscriber. The problem mostly resolved itself, but I still occasionally get the message. It isn't a huge deal since I can still access the content on Android or through a web browser. My team and I love the ITProTV subscription, but I do understand that some hands-on people might be challenged when the content doesn't include labs. Not everything has labs and that's ok by me. For those that need flexible training and access to Transcender practice tests... this is a no-brainer. ITProTV Review: "Awesome Fountain of Knowledge"
I personally have leveraged ITProTV not only to stay current on required CPEs but to kickstart my Certified Ethical Hacker training. Overall the training format and tools that they provide makes them immensely helpful and an extremely good value. Add that to the constantly updated and expanding selection of topics they cover makes it a one-stop-shop for anyone wanting to learn the many aspects of the IT industry. 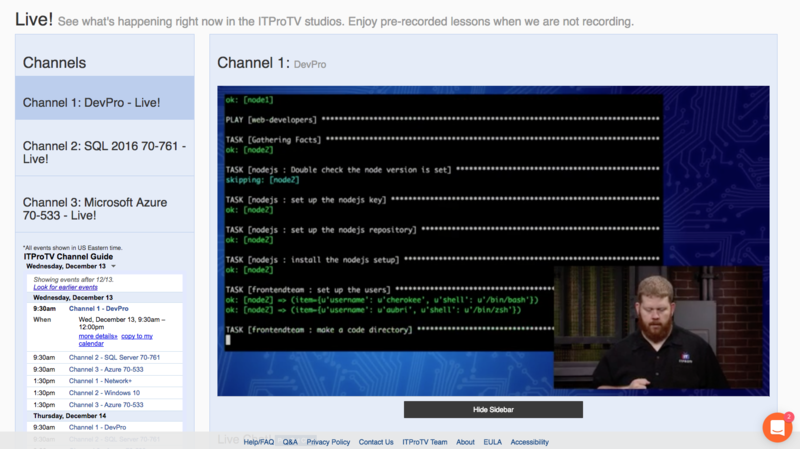 ITProTV --> Simply no better way to brush up on old skills or learn some new ones. The Practice Labs and Exams --> this alone is incredibly helpful and would cost quite a bit if purchased on their own. 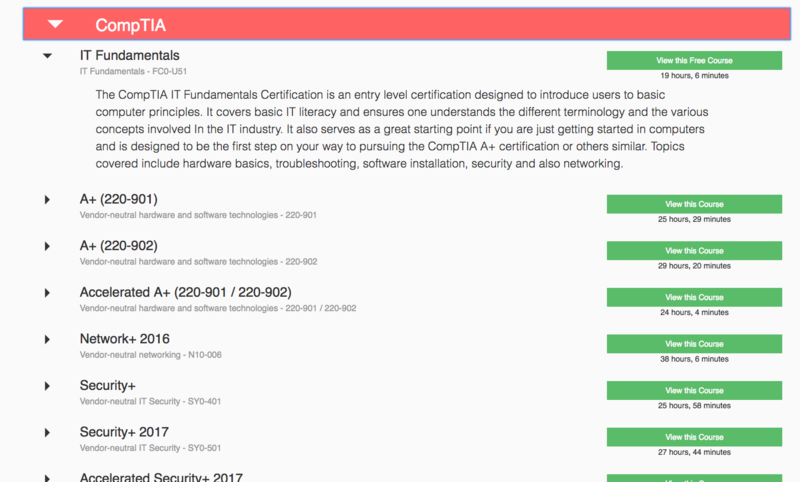 ITProTV is really good at giving a good intro to the material and helping you to identify which areas you need to do a deep-dive on, however it will take more self-study for most of the certification paths. If you have an office that always has "something" playing in the background, ITProTV's Live Stream is a great way to fill the vacuum and you might be surprised how many times you might pick up a new bit of knowledge incidentally! Self-study program for individuals preparing to sit IT exams. People are able to study at own pace and rewatch videos for review. They are also able to take practice exams and utilize online labs. Only complaint and which keeps me from giving a 10 rating is that I like to watch the videos on a TV. And only Amazon Firestick and Apple TV apps are supported at this time. I think a compatible Android TV app is needed. Well suited for people studying for exams, but not if you wish to watch videos on a bigger screen. User Review: "ITProTV is a great learning tool..."
It is being used by the IT department to broaden knowledge and certify engineers. Some of the practice tests have missing text in the questions and answers. Some of the functionality in the virtual labs do not work. ITProTV is well suited to providing more knowledge and skills to users in order for them to pass exams and gain experience with various technology through the use of the virtual lab environment. The site is very convenient, as I can save time by not having to create my own virtual environment. User Review: "ITProTV is awesome!" ITProTV is being used by the IT department in our organization for training. We have a wide range of experience so the training helps new employees as well as more advanced employees. There are many options for classes. I like that I can study for certifications and that I can brush up on individual technical skills when random issues arise. I like that the class atmosphere is detailed but also starts general leaving it open for all levels. I do not have any cons to report. Having worked on both the internet provider and internet customer side, I can say that understanding all the terminology and how it works together helps. It may seem repetitive but I would recommend a little more description on how technology interacts and define terms that may be not fully understood. ITProTV Review: "Labs ARE experience ..."
I was an IT Instructor for a "For Profit" IT Training program. Also, I am an IT Instructor for a public Community College, and I am now a product management consultant for a large company that also provides IT certification. As such I have been able to view the cert game from the inside and the outside. I advise ALL of my students to take advantage of the training that ITPro TV provides. Although some might view another trainer as competition, I view them as complementary. I assign ITProTV as "Home Work". I used the term "Home Work" because ITPro TV reinforces the work we perform in instructor led classes. They cover the three (3) legs of training. Videos, Test Banks, and Labs. Their videos are unique in that they are discussions between SME's (two trainers). Their Test Banks use the best of breed "Just Like the Test" exams. And again the Labs they use are also best inbreed, what you need to be able to do performance labs. I advise my students with thin job experience to list thier labs as experience because the fact is you did perform the activity. I also advise my students to build labs on thier own laptops and take them with them on interviews for "show and tell". ITProTV is useful in so many ways. ITProTV Review: "Best of the best and constantly updating"
ITPROtv was beneficial for me passing certification exams. Recorded sessions are downloadable making them portable when wifi is not available (air travel). The staff is very responsive for technical questions as well as site questions. No ideas - I like what makes ITPROtv unique. Great for individual and team collaboration to learn. We have a team of about 35 tech professionals which can be a bit pricey when looking for training options. The cost for 1 person going to a Microsoft class for PowerShell was crazy. ITProTV has all the training in videos that are easy to follow and learn from at a fraction of the cost! and that's just the beginning , I have techs learning networking, Linux, EH, and working on their Windows certifications. As a supervisor I can see who is using the system and how much they are using it. The online training videos are easy to follow and understand and broken into categories. The Supervisor portal allows a leader to keep tabs on usage. There are more training subjects than I expected which allows team members to to branch into areas they find interesting and keep learning. I believe they were a bit behind on some subjects, one of my staff mentioned they were hoping to see the latest SQL that has just released, but that was not available yet. We have ITProTv accounts for all of our desktop support staff, I believe if you work in a technical field this is well suited. I imagine if you are the top person in your field you may be disappointed, but as I mentioned before there are so many other training videos you can always find something new to learn about. ITProTV Review: "ITProvTV is like Netflix and chill for IT binge learning." I am not sure if ITProTV has been implemented across the company. I have coworkers that use it and have heard great things. I decided to subscribe to the monthly premium subscription to better prepare for IT exams, certification, and the labs that they offer. I have used other IT learning services, but the material was dry. I can tell the presenters really care about IT and helping people learn. The training has a good mixture of explanation, theory, and showing screenshots/demonstrations. The format for finding the right training material by vendor or exam is very easy. The content layout makes sense and makes navigation a breeze. Nothing to suggest yet in my experience so far. If you like to learn by visual and demonstration, ITProTV is a perfect mix. It is good for entry level to the more advanced technical experience. If you are looking for more coding or software development related training, there are other programs that are more suitable that I have found in my experience. I have worked in the infrastructure and help desk/system admin side of the house. My organization is not currently using ITProTV. I've been using it to further my own education and personal development. The sessions are lengthy 30-60 minutes in duration. For those with ADD taking frequent breaks might make more sense. Q/A features to administrative staff relating to subject matter might be helpful, or have it highlighted better on the site. Well suited for learning job functions that can be applied to the real world directly from objectives. It is a lot harder to apply learning when your focus isn't on what you are studying. We are using this program to train the IT staff. This provides us with the opportunity to keep our staff informed and broaden our understanding of new concepts. Keeps my staff up to date on testing and processes for certification. Allows me to use the App to watch or listen to programs on my phone. Has great customer support for when we have issues and problems. The length of programs is too long. Better notices for incomplete classes or session. This is great for people to use at home or on the road. If you can't afford to send someone to a Windows 2016 server class for a week, this is very good test prep. Being used by myself at home to stay proficient in computer subjects. Previously used across the whole organization as a formal training tool for attaining Comptia A+ certification. ITProTV needs to improve technical equipment and network infrastructure in order to avoid business outages. Well suited: Comptia and Microsoft certification training. Linux training. ITProTV offers training and course library content for IT that aims to be entertaining and engaging, as well as educational. According to the vendor, the training is more like a talk show: users watch an ‘edutainer’ engage with a host and an online audience to create a better-than classroom experience that the vendor calls "binge-worthy learning". Fresh new content is added every day and the course library of more than 3,300 hours covering all of the major certification courses (e.g. CompTIA, Microsoft, Amazon, ITIL, Apple, Ciso, GIAC, EC-Council) and non-certified courses (e.g. general tech skills, Linux, Admin, CyberSec) to keep your team's skills fresh. Learn wherever you go - from your desktop, tablet, smartphone or Fire TV, Roku and Apple TV. Keep up with the latest in technology with our constantly expanding course library, plus virtual labs and practice exams. ITProTV serves organizations of all sizes and across a variety of sectors, including federal, state, local government and education. A supervisor portal allows IT leads to see a roll-up of all training and prove the ROI of your training program. Individual memberships are also available. Has featureCorporate plans. Individual monthly and annual plans. Corporate memberships are available. Individual memberships are monthly or annual.